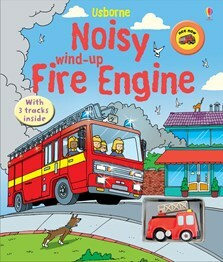 Three exciting fire engine tales with a wind-up model fire engine to bring the stories to life. The thick card pages have embedded tracks for the fire engine to rush to the fires. Includes a button to press to make the noisy fire engine go ‘nee-naw’. This hoot of a book comes with a small plastic wind-up fire engine which scoots around three different tracks – but it’s a bit more than a racetrack between covers. Each track is accompanied by a story chronicling some of the different events fire fighters get called out to. Beware of the loud siren which had my toddler smiling but me and his mother wincing after several minutes! We don’t sell an Usborne book that isn’t a real winner, and this one surely is. Three fire engine stories with a twist each with a sturdy track embedded in the pages and a wind-up fire engine to bring the stories to life. Also a siren button. Please come and take them off our hands before we are driven to distraction! My particular favourite has to the the Farmyard Tales Noisy Wind-up Fire Engine. A multitrack book complete with the most satisfyingly loud siren on the market. So what if parents are driven mad on Boxing Day? Every little boy of a certain age is going to want one of these.